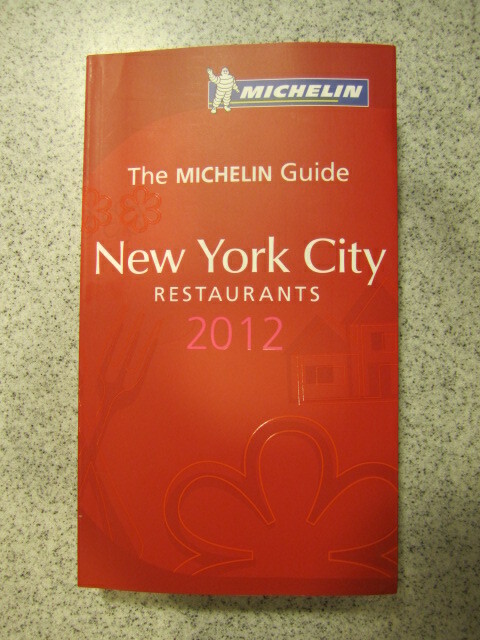 I got home from work today and — lo and behold — waiting in my mailbox was The Michelin Guide to New York City restaurants! Last week one of my clients was in town and wanted to thank me for the work I’d done for him during the past year, especially during a particularly painful stretch on New Year’s Eve. He took me to a very nice lunch at Tosca, a fine Italian restaurant near my office (which happens to be a favorite of Justice Scalia, who was dining at a neighboring table). In addition, once we were seated, this client handed me a very generous American Express dining gift card. I was totally caught off-guard by the gesture — I’ve never had any client go so far out of his way to say thanks. That night I asked Amanda if the Michelin Guide her parents had given her covered New York — because she and I are meeting there in March to see Juan Diego Florez sing L’Elisir d’Amore at the Metropolitan Opera, and I couldn’t think of a better occasion to redeem the gift card. Amanda said no, her guide only covered the major cities of Europe, which meant we’ll be eating well this summer in Berlin and St. Petersburg but would be on our own for New York. Not so anymore! Thanks (indeed, many thanks!) to Will and Susan (Amanda’s padres), we now have a complete guide to the gastronomical paradise that is New York City. I can hardly wait. I’ve been devouring the reviews all night, feeling pleased with myself for having already eaten at many of the restaurants and flagging all the new ones that I want to try. When I came to La Grenouille, which is described as “the Judi Dench of French dining,” I literally started giggling. I am SO the right audience for this book. Grandpa reads the dictionary for fun… I guess it shouldn't surprise me that you find great delight, unto giggling, in reading a gastronomical orientation guide. Buen provecho!